This week’s veggie basket made me smile when I opened it. It is a little more traditional than some of the baskets, but I love everything in it (well, I don’t like the mushrooms, but I exchanged those for a few apples). 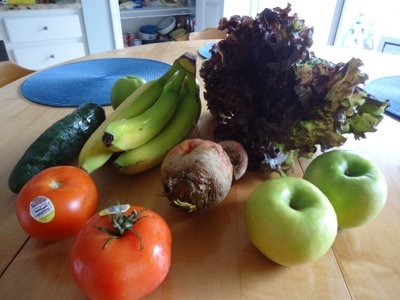 The red leaf lettuce is beautiful and if the bananas are half as good as the last bunch I will be a very happy girl. I’m super excited about the golden beets. I have a couple of ideas for them, but haven’t settled on any one yet; it will probably depend on what the butcher has that looks good tomorrow.